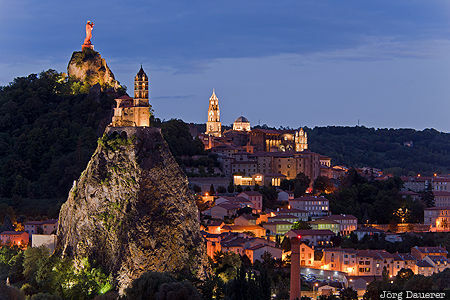 The flood-lit "skyline" of Le Puy-en-Velay dominated by its basalt peaks ("Puy") and the Rocher Corneille at the left and the church Saint-Michel dAiguilhe at the blue hour after sunset. Le Puy-en-Velay is in Auvergne in the center of France. This photo was taken in the evening of a cloudy day in September of 2015. This photo was taken with a digital camera.